Each season we buy a large batch of custom clothing for regular members and racing team members to "show the colors" of Greensboro's well respected club. For our 3rd year we are getting the wonderful quality SPECIALIZED CUSTOM attire and it is only available to current year club members. A 2019 order is being prepared now to arrive early in the year. While some extras are brought in, only those pre-ordering garments are assured of receiving their choice. 1.) RBX SPORT short sleeve. An all round garment for road, mountain and touring use. The fit is less snug as compared to others. - VaporRize™ knit fabrics tackle moisture management. - Deflect® UV 30 protects your skin from ultraviolet rays. - Reflective striping on back pockets. 2.) SL EXPERT short sleeve. - Form Fit: ideal for aggressive training or racing. - Reflect® UV 30 protects your skin from ultraviolet rays. - Heat transfer logo on collar. - Reflective striping along back pockets. 3.) 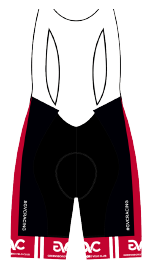 ENDURA SPORT 3/4 sleeve. - Crew neck style is simple and comfortable. storage or bent riding positions. - Standard Fit: ideal for comfort and endurance. compressive hold over the leg.